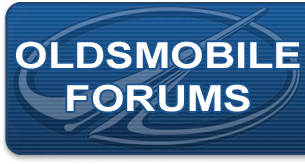 Oldsmobile Forum: So how can we improve? Well. For one thing - I know how you can help. Spread the word about our site! That's #1. We need people! Oldsmobile owners and enthusiasts are welcome. You don't necessarily have to own an Oldsmobile to be a member of this site. Have any ideas on how to make things better? Have a specific forum you'd like to see? Own a Cutlass Supreme and want a forum dedicated to it? Speak up! I agree that the best way to get the word out is to spread the word. Car show time is coming really quickly and that is the one place to do it. I think this is the best of the forums I have joined. There are a lot of friendly and knowlegable folks here. I wouldn't let people advertise on each thread, If I wanted ads I would watch TV instead. I know the stuff that appears above the quick reply helps pay the bills but when they post on each thread, I no like. Linking between other Olds Forums would probably get more people to the site. I would like to be able to post a topic with pictures without it getting turned down!!!!!!!!!!!! ^^I agree with that. I would love to have a signature/avatar but it won't allow me to do so. Banners for car shows work well. Also separate parts wanted and parts for sale section. On the other board I use they have a 5 post newb policy that cuts down on spam. You say you want to spread the word for this site. Why? Why would I be interested in telling my friends to join a site that makes it virtually impossible to let people know about a really cool Oldsmobile that is for sale that they could buy without being able to put a link to the information or pictures? Want to make this board better? I'm sure you have plenty of people that would love to be moderators. Let "new" members post what they want to post; for new members below a certain level put the post up for pending approval or do like some other forums do ... edit the post taking out content you don't approve of with an explanation. PS Sal, I sent you a PM and didn't recieve a reply so that's why I'm here posting this. If you are serious about making this forum better than you need to open the board up a little or at least tell new people what it is they need to do to go to the next level above the status of "New" so that they can post legitimate interesting posts. He's got beautiful 1969 Hurst Olds for sale. He's also got a bucket load of 69 Torandos and many other vehicles. If you want to see the specs for the 69 Hurst Olds then Google Muscle Car Ranch for the web site address and add /hurstolds to the end of it. The site recieves a fair amount of traffic and I'll put links to other sites for all who are sincerely interested in promoting Oldsmobiles and other classic cars. Last edited by wizarddrummer; May 2nd, 2011 at 07:26 PM.